The Sanctuary at Keystone is the newest townhome, duplex, single family subdivision to hit the Keystone Colorado Real Estate market. 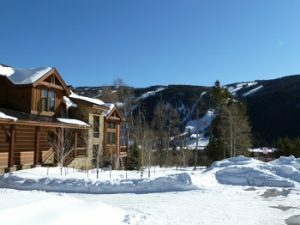 Located within a few minute drive to the Keystone Ski Resort these homes for sale in Keystone CO offer amazing ski slope views set in a tranquil setting surrounded by wetlands. If you are looking to be in Keystone but have amazing views with privacy the Sanctuary at Keystone is what you have been waiting for. With 30 home sites total in the Sanctuary at Keystone, comprised of 2 single family homes, 22 duplex sites and 6 townhomes there is a wide range of options for the discerning buyer. The largest benefit offered at the Sanctuary at Keystone is their on call shuttle that will take owners and guests anywhere in Keystone. You can’t find this amenity offered to any other home subdivisions in Keystone CO Real Estate. Within your residence you will be welcomed into a warm mountain environment with knotty alder trim and doors, rustic plank wood flooring, granite slab countertops, a warm fireplace of native stone and high end appliances. After taking the time to enjoy your residence you may want to step outdoors and take advantage of all Keystone has to offer. Whether it is skiing, snowboarding, snowshoeing or nordic skiing in the winter or golfing, hiking and biking in the summer, you will never have a dull moment in Keystone, CO. Arrange a private showing of these Keystone homes or others in Keystone Real Estate with Justin and Krystal Knott of LIV Sotheby’s International Realty.